- Ubit N600 Wireless dual-frequency network card, through the strict detection, quality assurance, customers can be assured to purchase use. - This item supports dual-frequency, support AP launch, support 2.4G/5G, compatible with all CPUs, large and small chassis general-purpose. - The N600 wireless network adapter will add high-speed 802.11 N Wi-Fi connections to your desktop computer via a PCI Express (PCI-E 1X) slot, allowing desktop computers to connect to the wireless network with 2.4GHz 300Mbps or 5GHz 867Mbps. - Wireless Connect to wireless 802.11AC/A/b/g/n devices, support 300Mbps maximum throughput in 2.4GHz band or 5GHz band, Compliance with 64/128 WEP，WPA / WPA2，WPA-PSK / WPA2-PSK（TKIP / AES）security protocols. [High-speed N600 Wireless PCI-E Network Card] High quality desktop built-in wireless dual-frequency network card, long service life, support AP launch, high-speed network, stable performance, ensure the integrity of data transmission. [Speed Increase 3 Times] Support 2.4GHz and 5GHz two working frequency bands, according to the surrounding environment and terminal equipment, free choice, effectively avoid wireless interference and network congestion, Wi-Fi more stable, faster and smoother. 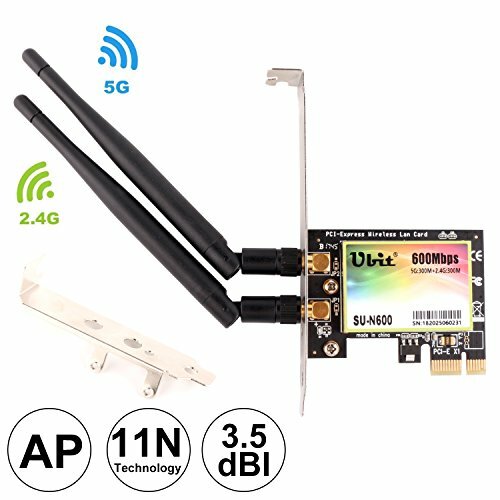 [High Gain Antenna] Removable and 360-degree rotation, N600 network card Configuration high purity oxygen-free copper gain antenna, through strict quality testing, to ensure safe and durable, but also enhance the wireless signal strength of the network card, improve the distance to receive and launch. [Wi-Fi Sharing-soft AP Features] Support the analog AP function, plug the product into a networked computer, you can build wireless Wi-Fi, more equipment can be connected to use, such as: desktop computers, All-in-one, laptop, tablet computer, mobile phone, smart TV,etc. [High Compatibility] System supports a variety of systems, such as Windows XP/Windows7/Windows8/Windows8.1/Windows10, supporting interfaces: PCI-E x1/x4/x8/x16 slots, Easy to install and you get lifetime warranty and 7x24h technical support, if you have any problems in use, please contact us, we will give you a satisfactory solution.